WWF works to stop the degradation of the planet’s natural environment and to build a future in which humans live in harmony with nature, by conserving the world’s biological diversity, ensuring that the use of renewable natural resources is sustainable, and promoting the reduction of pollution and wasteful consumption. The objective of this report is to shed light on the link between investments and threats against the World Heritage sites. WWF wants to increase awareness around this issue among the Norwegian general public and authorities – as owners of the sovereign wealth fund – and the financial institutions that invest savings and pensions. At the same time, WWF wants to engage investors in order to contribute to increase the protection that these places should get. This report is part of the wider work that aims at making the finance sector accountable for the risks related to the loss of biodiversity. The United Nations Educational, Scientific and Cultural Organization (UNESCO) has worked for a long time to identify and protect more than 1000 World Heritage sites. The protection of these sites is also an objective of UN’s sustainable development goals. UNESCO, the International Union for Conservation of Nature (IUCN), WWF and 24 of the leading mining companies that are members of the International Council on Mining and Metals (ICMM) have a clear position stating that oil, gas and mining activities are incompatible with the status of World Heritage sites. In spite of this, WWF has found that in 2017 a relevant number of natural World Heritage sites – 55 out of 238 – are threatened by companies owning active licenses for the exploration and/or production of oil, gas and other minerals.These activities can lead to irreversible loss of biodiversity and habitat, destruction of ecosystems, introduction of invasive species and pollution of air, soil and water. Finally, they can threaten the livelihoods of the communities that live inside and around these sites. WWF has analyzed the investments of Norway’s largest financial institutions: The Government Pension Fund Global, the Government Pension Fund Norway, DNB, Storeband and KLP. The analysis shows that they have invested more than 150 billion norwegian kroner in 26 companies that – directly or through subsidiaries – own licenses to explore or produce oil, gas and minerals in 17 natural World Heritage sites. Develop clear “no-go” guidelines for oil, gas and mining activities that apply to all investment channels such as project financing, loans, stocks and bonds. Identify companies that have licenses to explore or produce oil, gas or other minerals inside or around World Heritage sites. Use active ownership to stop activities that can damage the World Heritage sites, and consider exclusion if a company does not change its behaviour. Our share heritage is under threat. The analyses that WWF has produced during the past years show that there are several international companies which – often trough their subsidiaries – own or operate licenses for the exploration and production of oil, gas and minerals in World Heritage sites. WWF has analysed the portfolio of five major Norwegian financial institutions – to see how much the invest in these companies. The analysis only covers stocks and corporate bonds, not loans or project financing. 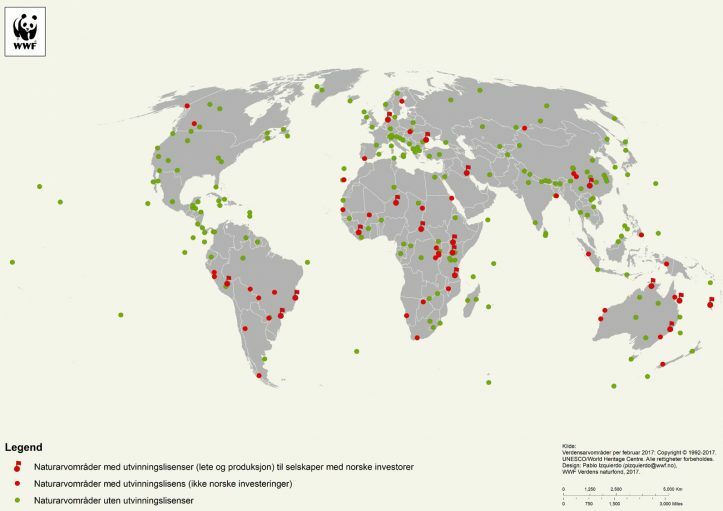 The results shows that in 2017 these institutions have invested together more than 150 billion Norwegian kroner in 26 companies which have licenses to explore or extract oil, gas and mineral in 17 World Heritage sites. 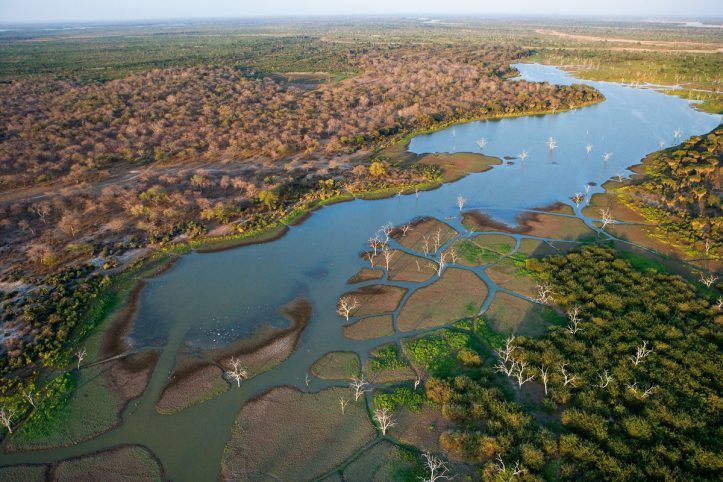 3 of these sites – Selous Game Reserve, Aïr and Ténéré Natural Reserves og Manovo-Gounda St Floris National Park – are on the UNESCO’s List of World Heritage in Danger. It’s important to note that the ownership of a license does not imply that the company is actually carrying on some activities. Unfortunately, there is not clear overview of what is happening on the field. It’s exactly this lack of systematic information that constitute part of the problem we want to highlight with this report. The results are limited to licenses falling within the area of the UNESCO World Heritage sites. However, it’s important to underline that extractive activities outside and around the sites can also constitute a threat, for instance by polluting rivers and other water sources that flow through the sites. 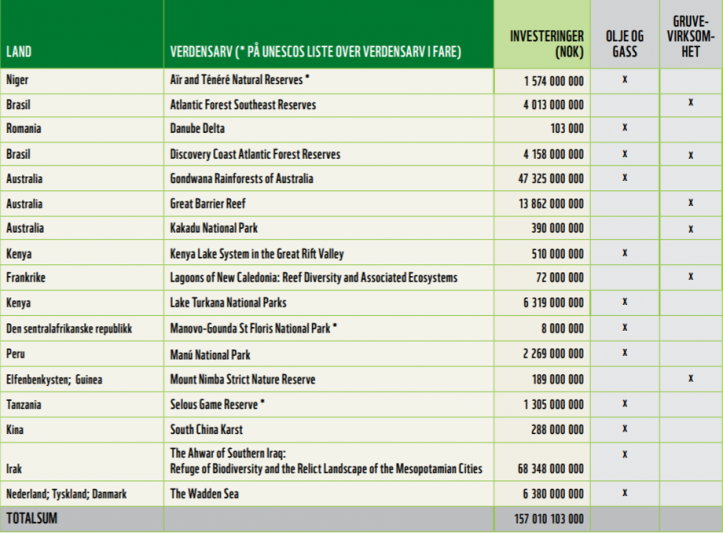 Table: World heritage sites and Norwegian investments in companies with licenses to explore and/or extract oil, gas and minerals. Many of these licenses are owned directly or indirectly through subsidiaries belonging to companies in different countries. Stocks and corporate bonds are traded by financial institutions such as pension funds, insurance companies, asset managers and sovereign wealth funds which typically invest – on behalf of their customers – in a variety of companies thorough all sectors and markets. Most of the financial institutions have guidelines that take into consideration environmental and social aspects. Nonetheless, WWF has experienced that few investors have systems in place and access to data to being able to – for instance – identify companies’ planned or ongoing activities in World Heritage sites and other important areas. It is challenging for investors and others to identify such activities, as large extractive companies have thousands og licenses and projects. Access to knowledge on the status of active licenses is not always publicly available, and quality varies from country to country. In addition, companies have complex corporate structure which are not transparent and this make it difficult to track licenses from subsidiaries to mother companies. Companies own reporting on this issue is generally poor. WWF wishes to contribute to increase this knowledge and access to data, and build a constructive dialogue with financial institutions to develop better policies, guidelines and systems to protect the unique values of our share heritage. 7 of these 55 sites are on the UNESCO’s List of World Heritage in Danger. In many cases, extractive activities are especially mentioned as a threat: Manovo-Gounda St Floris National Park; Kahuzi-Biega National Park; Okapi Wildlife Reserve; Selous Game Reserve; Tropical Rainforest Heritage of Sumatra. Map: Colour 1: the 238 natural and mixed World Heritage sites. Color 2: sites threatened by extractive activities. Color 3: sites with one or more companies in which Norwegian financial institutions invest in. WWF’s objective is that all financial institutions have in place effective guidelines that prevent financing to extractive activities that threaten World Heritage sites. Develop clear “no-go” guidelines for oil, gas and extractive activities in all World Heritage sites, that apply to all investment channels such for example project financing, loans and investments in stocks and bonds. Survey if companies in the portfolio have policies on activities within or around World Heritage sites. Identify companies that own licenses for the exploration and production of oil, gas and minerals i\within or around World Heritage sites. Integrate guidelines and data in the existing risk-management systems to identify potential risks as early as possible. Use active ownership in dialogue with companies to stop activities that can damage World Heritage sites, and consider exclusion if the company does not comply. Cooperated with other financial institutions and industry associations to ensure a wide adoption of “no-go” policies. Request that companies report on their policies, licenses and current activities within or around world heritage sites. Make investors guidelines publicly available and request that they are officially recognized by UNESCO. Report on active ownership and eventual exclusions. Report on licenses and current activities within or around World Heritage sites. Implement a “no-go” policy and request official recognition by UNESCO’s World Heritage Committee. Stop all ongoing or planned extractive activities in World Heritage sites. Cooperate with other companies and industry associations to protect World Heritage sites.